I created this onesie bouquet for my friend's baby shower. The bouquet has six onesies in it. 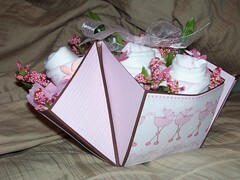 The basket of the bouquet is created from the treat box tutorial on Splitcoast. The papers are by Heidi Grace (found on sale at Joann's) and the flowers are the bucket of flowers from Michael's in the bridal section (found on clearance for $2).